As we enter the fourth week of the regular season, things are starting to take shape in each classification. While there are some clear cut favorites in some classes, others have several contenders vying for one of the top five spots. It is a bit unusual to have so many ranked teams with losses, and two ranked teams even have a losing record after three weeks. The regular season is all about challenging your team and preparing them for district play and the playoffs. We believe the teams that have done so will be one’s still standing well into November. Here’s a look at the Kpreps Top 5 for Week 4. Shawnee Mission East surrendered its first points of the season in Week 3, but the Lancers still rolled to a 44-20 victory over Shawnee Mission Northwest. SM East has a big showdown this week with unbeaten Shawnee Mission West. Blue Valley remains at No. 2 in this week’s poll after picking up an impressive 42-35 win over 4A-I No. 1 Bishop Miege. The Tigers rushed for 408 yards in the win over the Stags led by A. J. Totta, William Evans, and quarterback Colton McCumber. The Lawrence Lions move up one spot to No. 3 this week after holding off rival Lawrence Free State, 14-12. The Lions replace last week’s No. 3 team Derby, which fell out of the poll after a 27-20 road loss at 5A’s top-ranked Mill Valley. There is some shake up in the bottom half of the poll as Hutchinson enters the poll at No. 4 this week. The Salthawks are unbeaten but will travel to Derby this week. Wichita Northwest edges out Topeka High this week for the No. 5 spot in the rankings by a few votes. The Grizzlies have an impressive resume of wins already this season having beaten Bishop Carroll and Kapaun Mount Carmel. Topeka High, Shawnee Mission West, and Derby are just outside the top five. Mill Valley retains their No. 1 ranking in Class 5A and more importantly passes another big test with a 27-20 win over Derby. Logan Koch tossed a 28-yard touchdown pass to Tristan Milne on fourth-and-12 to give the Jaguars the 27-20 win. All-state running back James Cosentino returned to the field for No. 2 St. Thomas Aquinas and helped the Saints rout Blue Valley Northwest 42-13. Aquinas has a tough road test at Bishop Miege this week. Bishop Carroll had little trouble with rival Kapaun Mount Carmel in a 47-7 rout. The Eagles picked up their 17th consecutive win in the Holy War, and now must prepare for Wichita Heights this week. Pittsburg remains at No. 4 this week after a 37-0 shutout at Fort Scott in which the Purple Dragons held the Tigers to five yards of total offense. St. James Academy debuts at No. 5 this week. The Thunder remained unbeaten after a 26-10 win over De Soto and take on Jefferson City (Mo) Helias Catholic this week. As mentioned earlier, Bishop Miege fell 42-35 at 6A No.2 Blue Valley last week. The Stags remain in the top spot in our Class 4A-I poll, however. Carter Putz passed for 352 yards and four scores as Miege played without all-state running back Dawson Downing. Buhler quarterback Jace Williams returned to the field and led the second-ranked Crusaders to an easy 54-6 win at Winfield. Williams was injured in a Week 2 win over Mulvane, but returned to pass for 157 yards and three scores in Friday’s win. Topeka Hayden moves back into the No. 3 spot this week after a 21-14 win over Manhattan; their first over the Indians since 2007. The Wildcats narrowly move in front of No. 4 Andover Central who had to rally from a 15-point deficit to top Goddard, 28-21. Finally, Ulysses rounds out the top five in 4A-I after the Tigers beat Holcomb, last week’s top-ranked team in 4A-II, behind a 320-yard effort from Ian Rudzik. Holcomb’s loss to Ulysses means there is a new No. 1 team in Class 4A-II, and that team is the Columbus Titans. Columbus wrapped up a 45-13 victory at Galena on Monday night after their game was suspended on Friday due to weather. Titan senior quarterback Trey Robinson has seen some significant playing time since his sophomore season and has completed all 24 of his pass attempts so far this season. Andale remains ranked No.2 in 4A-II despite a 1-2 record. The Indians led Wichita Collegiate by 16 points on two different occasions in the second half before the Spartans rallied to force overtime. Collegiate, ranked No. 3 in Class 3A, scored first in overtime and later stopped an Andale two-point attempt to hold on for a 46-45 win. Holcomb falls two spots to No.3 this week, while Holton picked up its first win of the season and remains at No. 4. Clay Center enters the poll at No. 5 after a 40-20 win over Chapman. 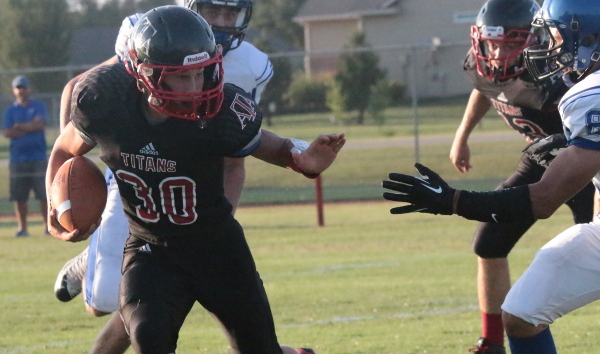 The Tigers replace Osawatomie in the top five after the Trojans fell 22-21 to Pioneer League rival Wellsville. The most consistent classification this season has been Class 3A. There has yet to have been any changes to the Class 3A poll this season. Rossville remains in the top spot after a 353-yard, five-touchdown rushing effort from quarterback Tucker Horak. Scott City remains at No. 2 just ahead of Collegiate and No. 4 Halstead. Silver Lake didn’t require overtime in Week 3 as the No. 5 Eagles routed Riley County, 40-6. Meade is still on top in Class 2-1A after a 49-0 blanking of Southwestern Heights. Sedgwick shutout Ell-Saline 31-0 and remains at No. 2, while Phillipsburg exploded for 76 points in a 76-42 shootout win over Plainville. Smith Center remains ranked fourth this week after shutting out Thomas More Prep. The Redmen will be challenged by unbeaten Norton this week. Finally, Marion is ranked fifth after rushing for more than 430 yards in a 42-27 win over Whitewater-Remington. Eight-Man, Division I’s top five remain unchanged this week as each ranked team posted double-digit wins. Third-ranked Solomon used a big second half to pull away from Rural Vista, and No. 5 Burlingame pulled away from Frankfort in the fourth quarter thanks to a solid performance from sophomore quarterback Dalton Sporing. Hanover blasted a short-handed Wakefield team 48-0 to earn a key district win. In Class 8-Man II, Victoria, Sharon Springs-Wallace County, and Argonia-Attica remain in the top three spots after blowout wins. Ingalls was tied with Minneola at 24 just before halftime, but the Bulldogs scored the next 48 points to run away with a 72-24 win. Beloit St. John’s-Tipton remains No.5 this week after a cruising to a 45-0 shutout of Southern Cloud. The Blujays get a tough test this week from a Pike Valley team that sits just outside the 8M-II top five rankings.